As another football season gets underway our data points towards a successful summer for Sky Sports on the ad front. Its ‘Feel It All’ campaign – which has a football specific version as well as one highlighting its wider stable of sporting offerings – aims to emphasise some of the iconic moments that Sky has broadcast. YouGov brand tracking data indicates how well Sky Sports’ advertising efforts performed in the run up to the big kick-off. 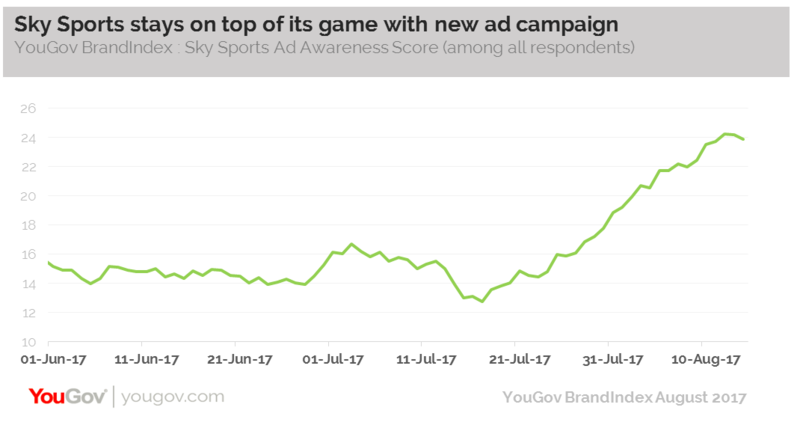 Its Ad Awareness score (whether someone has seen an advert for the brand in the last fortnight) has spiked quite dramatically, moving from 12% mid-way through July, to 24% now. As one would expect, the improvement is even more marked among those who follow football. Among respondents from this group, Sky Sports’ score has jumped from 16% to 31% over the same time period. Over the last few years, Sky Sports has been engaged in battle with rival broadcaster BT Sport. Our data indicates that while BT Sport has also had a successful campaign it hasn’t reached the same heights as Sky so far – its Ad Awareness score growing from 6% to 15% among the population at large. Sky Sports rebranding and realignment of its offer is one reason consumers may have noticed its adverts this summer. As it celebrates 25 years of the Premier League, the broadcaster has recognised that viewing habits are changing. Customers can now subscribe to channels dedicated to specific sports, a shift away from the ‘everything in one place’ offer it has championed for years and a move that brings it nearer to on demand services like Netflix. While Sky Sports has a dominant position in the market, bosses will hope this latest innovation will help counter some of the less positive perception that exists across sports subscription sector. Our data shows that both Sky Sports and BT Sport currently have negative Value for Money scores (-15 and -10 respectively), though they both are recognised for the quality of their offering among fans (+17 and +10). Despite these challenges, Sky Sports can be content that its advert is hitting home.